"Sometimes, you read a book and it fills you with this weird evangelical zeal, and you become convinced that the shattered world will never be put back together again unless all living humans read the book." As you well know, I'm a sucker for a good book. 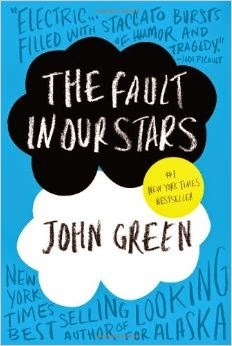 The Fault in Our Stars was recommended to me by many but remained on my Kindle 'to-read' list for a good while before I got around to reading it. The premise of the story is a gloomy one. Hazel, a self-titled unextraordinary individual meets an attractive stranger at a support group intended for teenagers struggling with cancer. The attractive stranger is seventeen year old Augustus Waters, in remission from cancer and assisting his friend Isaac in coming to terms with eye cancer. He buys cigarettes but doesn't smoke them, purely for the metaphorical value. Their spontaneous meeting results in them both agreeing to read each other's favourite novels and so a love story ensues. So far, so cheesy? Whilst it sounds like a slushy teen romance novel, the book is more substantial than that. The characters of Hazel and Augustus are so well developed and multidimensional that you cannot help but become drawn into their story. In addition, the subject matter is handled well and with good humour. Rather than venturing into the realms of misery literature, it gives a real perspective on what it means to be someone who is battling cancer. What I loved most about the novel was it's ability to be romantic without romanticising their situation. Very real and sometimes graphic, it shows that the romance lies in Augustus and Hazel's relationship with one another rather than the tragedy of circumstance. I don't want to say too much about the book as I don't want to give too much away. It is definitely one to read all at once, perhaps in an afternoon, as it was sometimes difficult to put down. Give it a read and you'll see exactly what I mean.